This week, Jaywick in Essex was evacuated. This should be a stark reminder of the real threat of flooding that we face across our district. Just a few years ago, flooding caused devastation for families in Rayleigh when their homes were flooded. Our own home too, came under threat. Although not in the news this week, Rochford District could easily be back in the news in the blink of an eye. The flood risk is severe and mother nature has no mercy to it’s victims. So what are are Lib Dems doing? 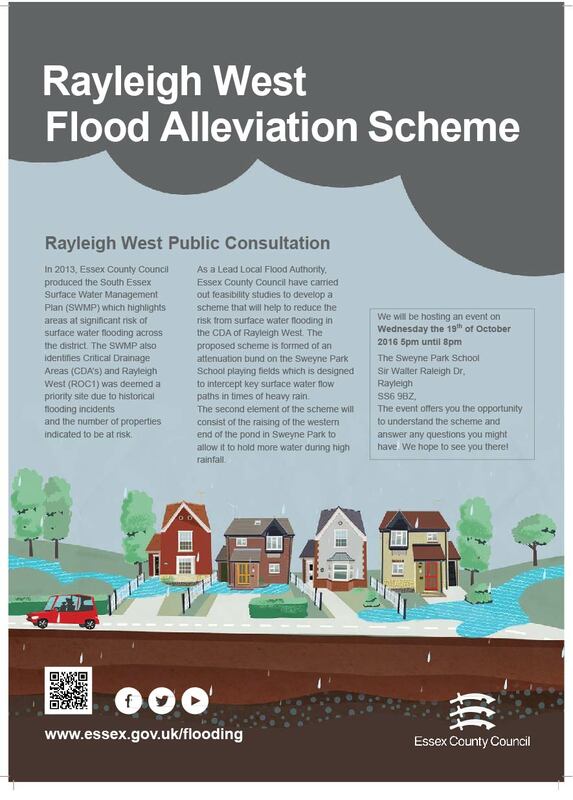 If you are living under threat from flooding and live in Rayleigh, the Town Council operate a sandbag scheme. More details can be f﻿ound in this link. Many residents of Rayleigh will remember the terrible flooding that unfortunate homeowners experienced in 2013 & 2014. Today we have received details from Essex County Council of the proposed flood alleviation scheme. The first part of the scheme will involve making alterations to the existing pond in Sweyne Park and the second element of the scheme will involve making an earth bund on the Sweyne Park School Field. This is all of course subject to planning consent.